The 49ers played their hearts out today in the NFC Championship game and have no one to blame but Kyle Williams for their loss. It was a shame to see two horrible plays made by the unintelligent Williams. There was a third error on the double reverse but luckily the Niners recovered. 1. 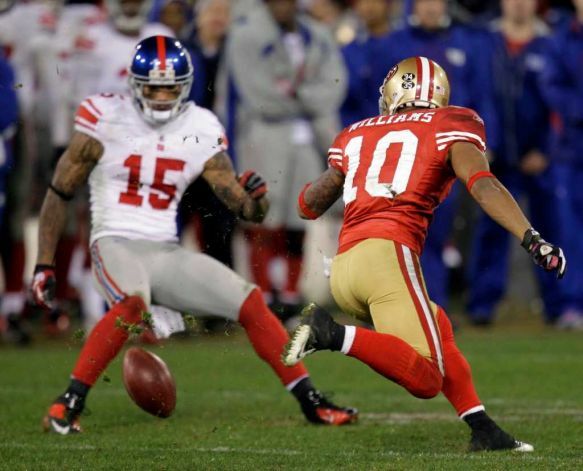 After a big defensive stop in the 4th quarter with the 49ers in the lead, Williams lets a punt go but hovers just close enough to the ball to let it hit him in the knee and the NY Giants pick it up. He then has the audacity to pretend like he didn’t know it hit him in the knee when the ball bounced off his knee cap. They teach you in pee wee football that if you’re not going to field a punt, you run in the opposite direction of the ball! Williams thought it was a good idea to hover close to a wildly bouncing ball with a bunch of Giants approaching him. The Giants recovered on San Francisco’s 29 yard line and scored a touchdown. 2. In overtime with the game on the line, Kyle Williams FUMBLES the punt after another great defensive stop. Williams did NOT tuck the ball upon catching it and as one, single Giant player came to tackle Williams the ball was knocked out. What do you expect to happen when you don’t protect the ball Kyle Williams? 3. In other mistakes Williams made that were not game threatening but still bone-head plays, he fumbled a double reverse when the ball was tossed right into his hands (the 49ers recovered). 4. In a horrendous calculation of risk versus reward, he dove forward to catch a punt with three Giants around him when the proper play was to let the ball go. Thankfully he did not lose the ball that time. 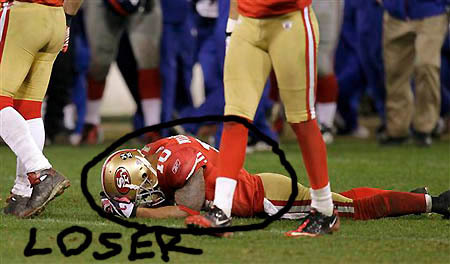 Thanks for single-handedly losing the San Francisco 49ers the NFC Championship Kyle Williams. Now that this game happened long ago, I hope you have cooled down. First of all, you’re an idiot. Second of all, do you remember how great the offense was with 3rd down conversions that game? Let me refresh your memory, they went 1-13, the only successful conversion was the final play of the 4th quarter. Third, all the WRs that day weren’t doing well, between all of them they only caught one ball for a 3 yard gain. Finally, I hope you realize how terrible your post was. Kyle Williams became one of my favorite players last year, and he still is, he made some great TD’s during the regular season when no one knew who he was. I hope he does well this year. I also hope when ever you are thinking of writing another hate filled article that you take your time to consider the whole picture.